Gunnar Hillert, who help organizes DevNexus posted a blog, encouraging speakers to spread the word about the conference. So here I am. TSSJS 2011, Vegas, Thursday 17th March @ 10:00 "Apache Camel: Tales from the Leading Camel Experts" along with James Strachan. DevNexus, Atlanta, Tuesday 22th March @ 10:45 "What Riding the Apache Camel can do to make integration easier for you"
CamelOne, Washington DC, Tuesday 24th May. I am not sure when I will be speaking, but sure it will be about Camel, and also the more advanced stuff you can do with it. So I am exited to go on the road again. However the double event in the states, leave me away from family for about 2 weeks. This would be my 2nd visit to Las Vegas, and this time I make sure to see the "big hole in the ground they have". I will also visit some of our FuseSource customers while I am in town. If you go to any of those event, then I would love to meetup and say hi. Maybe even cheers over a beer. 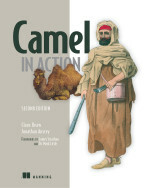 And if you have a copy of the Camel in Action book, then take it along, and you can have it signed.